After a short briefing and your luggage has been packed into the car, you drive to Tarangire National Park. This park belongs to the most attractive ones in northern Tanzania due to its diversified landscape and animal kingdom. Besides one of the biggest elephant populations in East Africa it is home to different big cats like lions, leopard and cheetahs, additionally you will find giraffes, buffalos, zebras and many antelope and gazelle species. Today you will enjoy long game drives and stay overnight at Maramboi Tented Camp outside the park. A short drive will bring you to Mto wa Mbu after breakfast. Together with a guide you make a round-tour through the village. Visit the banana plantations, paddy fields, local breweries (banana beer) or the local school. During this round-tour you get an interesting insight into the daily living of the different ethnos. Afterwards a traditional African lunch is waiting for you. In the early afternoon you drive further on to Karatu at the Ngorongoro Crater highland. The African rift valley seperates the dry lowlands from the green highland. From your car and during the photo stops you can discover unique views. If there is some time left after your arrival, you may have a walk through the coffee plantations (optional) and learn interesting things about growing coffee. You stay overnight at Endoro Lodge. Today you have to get up early. You have breakfast at your lodge and afterwards drive over an adventurous path down into the world-famous Ngorongoro Crater. This caldera was called the eighth wonder of the world by Prof. Grzimek and is home to perhaps the biggest animal kingdom world-wide. In the grass steppes and the acacia forests you will find nearly every animal of the East African savannah and can often see the Big Five - lion, elephant, buffalo, rhino and leopard - within only a few hours. After long game drives and a picnic amidst the crater you leave the crater ground and drive through the endless plains of the Serengeti. It might be Tanzania's most popular park and is home to the unique animal migration. You stay overnight at the Kati Kati Tented Camp in central Serengeti. In the early morning you start your next game drive and enjoy the nature around. Back in the lodge, a relaxing breakfast is waiting for you. Alternatively you may enjoy a balloon ride with subsequent champagne breakfast amidst the bush (for a surcharge and with prior reservation). On request you may also have a look around in the visitor's center that was build in cooperation with the Zoological Society Frankfurt. Here you will learn about the actual efforts in environmental protection and the 30 years of research. 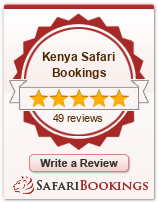 Afterwards you enjoy further game drives and again stay overnight at Kati Kati Tented Camp. During your drive out of Serengeti you look for the animals that you weren't able to see during the last two days. After leaving the park your safari leads you to Lake Victoria, the biggest lake in Africa and by surface-area the second-largest fresh-water lake world-wide.The region around the lake belongs to the most copious and densest populated areas in Tanzania. The stop at Lake Victoria gives you the possibility to learn more about the country, its inhabitants and the life in a rural region of Africa. You stay overnight at Speke Bay Lodge. After breakfast you go on a boat excursion at Lake Victoria, accompanied by a guide and some local fishers. You will be shown interesting things about the traditional way of fishing and can marvel at a nightly catch in a nearby fishers' village. Afterwards you drive on to the Kenyan border. The next two days enable you to discover the Masai Mara during long game drives. Amongst others you will visit the Mara River which is one of the biggest barriers for the animals during their annual migration. It's nearly impossible to imagine how thousands of zebras and gnus try to reach the opposite shores of the rivers, while crocodiles are already waiting for their meal. But also during other seasons you will see hippos, crocodiles and other animals here. You spend two nights at Mara Ashnil Camp outside the game reserve. You leave Masai Mara after a long breakfast and reach Lake Nakuru National Park in the early afternoon. The Soda Lake which is a nature reserve is the base for many water birds and seasonally returning flamingo colonies. Furthermore Lake Nakuru National Park is the best place to watch black and white rhinos in their natural surroundings. Overnight stay at Flamingo Hill Camp outside the park. Today you drive back to Nairobi and enjoy some free time after having checked in your hotel. Discover the colourful capital (taxi will be needed) or go shopping and check your emails. You stay overnight at Delta Hotel. You leave Kenya's capital and drive towards Amboseli National Park. From here you have a breathtaking view to the highest mountain in Africa, the Kilimanjaro. With a little bit of luck you will see some giraffes or elephants in the front and the majestic mountain with its snow-capped peak in the back. A unique motive for a picture! Huge elephant herds with over 500 animals, lions, cheetahs as well as different antelope species can be seen here as well. Overnight stay at Ol Tukai Lodge in the park. On your way to the park gate you enjoy a last game drive. Afterwards you drive towards the Tanzanian border. After completing the entry regulations you drive to Arusha, the starting point of your safari. After your arrival in the afternoon and according to the prosecution of your holidays you will be brought to the airport (Arusha or Kilimanjaro Airport) or to your hotel. Here you will say Goodbye to your guide.